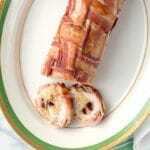 Woven bacon is a great addition to wrapping meats or to create on its own for an impressive sandwich. On a piece of wax paper, lay three strips of bacon horizontally with the long edges touching. Fold the middle piece of bacon in half back onto itself. Place a fourth strip of bacon vertically across the top bacon slice, middle gap and bottom bacon. Fold the middle piece of horizontal bacon back over the vertical piece of bacon. Fold the left side of the top and bottom slices of bacon back over the vertical slice of bacon. Place a fifth slice of bacon vertically over the top gap, middle bacon and bottom gap; fold the top and bottom horizontal bacon back over the fifth piece of bacon. Fold the right side of the top and bottom pieces back over the vertical strip of bacon. Place the last vertical strip over the top gap, middle bacon and bottom gap and fold the horizontal strips of bacon back. Place a second piece of wax paper over the top of the bacon weave. Using a rolling pin, gently roll over the bacon weave to bring all of the edges together and create a uniform thickness. Remove and discard the top piece of wax paper. Wrap around the burger and grill or cook (skillet or in oven) until done. Cut the 3 slices of bacon in half and create a bacon weave using instructions above. Line a baking sheet with foil (for easy clean up) and place a rack inside the baking sheet. Place the prepared woven bacon on the rack and bake for 15-20 minutes to desired crispness. Drain on a paper towel (or pat excess fat with paper towels and enjoy. The bacon weave may be made to any size using these guidelines. Based on how it will be used, by itself or wrapping around something, size to the desired needs. Refer to step-by-step photos for a visual tutorial on making a bacon weave.